A stainless steel bath tap with a built in shower head, all finished in a brushed 316 stainless steel. The latest in European styling, this designer bath filler is supplied with a deck mounted water spout, with a wall mounted version also available to special order. 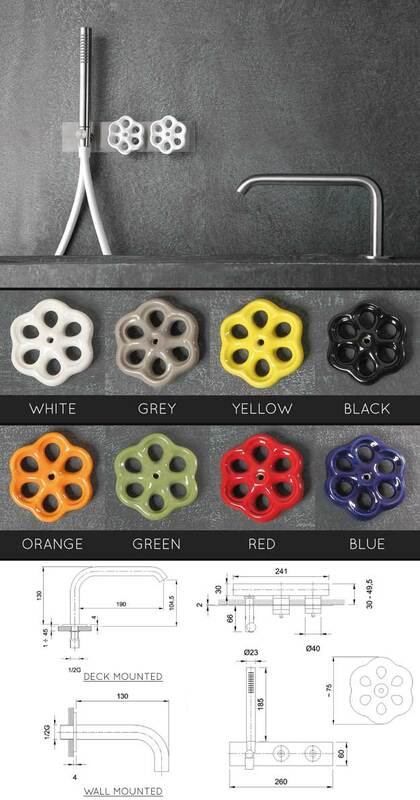 The tap and shower is operated via 2 mixer valves, each with coloured porcelain handles available in 8 different colours. * Latest Italian designer taps. * Unique and exclusive styling. * With wall or deck spout. * 316 quality stainless steel. * 8 tap handle colours.